In episode 620 of This Week in Startups, Jason sits down with Gagan Biyani, CEO and cofounder of Sprig, formerly of Udemy and — Jason learns through the course of the conversation — Lyft. They discuss Gagan’s background in entrepreneurship and peer-to-peer services as a foundation for the work he’s doing with Sprig, a brand-new Sprig feature, and the tremendous future he predicts for the company. Here are a few other highlights from this episode. Jason and Gagan spend the first part of the episode discussing Gagan’s professional background and the elements that came together to lead him to co-found Sprig. In the course of this conversation, they mention how technology didn’t even present the opportunity for fresh, ready meal delivery a few years ago: without GPS, Uber and Lyft wouldn’t exist. Without driver-on-demand services, the idea for home delivery of meal delivery didn’t have a space to exist. They comment how this is often the case with major innovations: you don’t know what’s going to happen until the foundation is laid for an entrepreneur to take advantage of that opportunity. At one point, Gagan makes a statement that may sound crazy to most entrepreneurs: he considers it his goal to be an activist, not just to make money. In that way, he says his personal mission as an entrepreneur overlaps with projects that help others: Udemy provided a new model of education, and Sprig improving the health quality of the food we eat. Especially for an entrepreneur with such an impressive track record (he also had a stints at TechCrunch and the aforementioned Lyft, as well as co-founding Growth Hackers Conference), it’s refreshing to hear that his ambition comes from a personal place. During the episode, Gagan gives Jason a demo of a new feature in Sprig: labels on each meal that give deeper insight into the nutritional breakdown of that meal. The three labels “clean,” “balance,” and “fuel” help consumers gain information about the meal (calorie count, protein/carb/veggie breakdown) at a glance, and help distinguish Sprig on their mission and value proposition of providing healthier options to their users. Jason and Gagan discuss how this helps make a company stand out in a sea of competitors, too. Gagan and Jason touch on the concept of unit economics several times in their conversation — both relating to Sprig, and other companies too. The conversation underscores an important fact that bears repeating: VCs and investors care about unit economics, and if you want investment in an increasingly tough market, you have to understand how your company gains revenue for each unit sold, and hopefully when you’ll break even. Toward the end of the conversation, Jason and Gagan chat about how companies like Uber and Sprig not only bring tech jobs, but they’re helping employ people with many other kinds of skill sets: drivers, cooks, delivery people, and more. In addition to receiving the benefits of services like Uber and Sprig, cities can also receive economic benefits. Businesses can give back in lots of ways, and the good companies of the future will survive because they do so. Want to hear the whole conversation? The full episode with Gagan Biyani, as well as past episodes are all available on This Week in Startups. 7:25 – 11:00: Gagan discusses his history in P2P work, starting at Lyft following his time at Udemy. 16:21 – 19:01: Jason asks Gagan about where his idea for Sprig came from and how technology enabled this leap in food delivery technologies. 19:01 – 20:36: Gagan explains the kinds of differences between the food delivery and ride markets. 29:35 – 30:52: Jason asks Gagan: “Who are the whales?” and the chat more about target, high value customers. 33:48 – 35:49: Gagan and Jason talk about the different growth metrics Sprig is measuring and the kind of success they’re seeing. 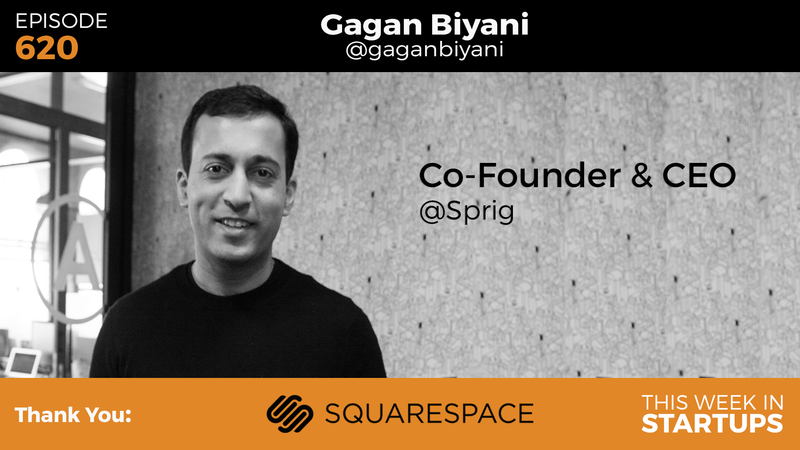 37:03 – 39:22: Gagan gives insight into his personal philosophy of entrepreneurship, and how that ties into Sprig’s mission. 39:23 – 42:50: Jason and Gagan discuss the quality of food, Sprig’s ability to iterate, and competitors in the space. 42:50 – 53:24: Jason asks Gagan about Sprig competition: UberEATS, Munchery, and Blue Apron. 64:15 – 67:47: The conversation turns back to unit economics. 67:47 – 73:52: Gagan and Jason discuss Sprig moving into new cities, food trucks, and other aspects of the business. 81:09 – 83:47: Jason and Gagan talk about the demand for drivers between all of the companies looking for people to move things in these industries. They finish by discussing how delivery/driver based industries are improving the job market.